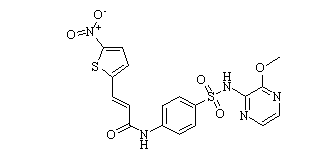 GW806742X is a small molecule MLKL (Mixed Lineage Kinase Domain-Like) interactor that binds the MLKL pseudokinase domain (Kd=9.3 uM), retards membrane association to inhibit necroptosis. 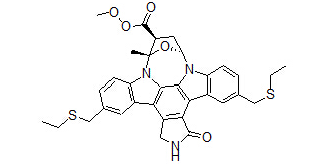 CEP-1347 (KT-7515) is a potent and selective MLK inhibitor that completely rescues motoneurons and inhibits JNK1 activation with IC50 of 20 nM. 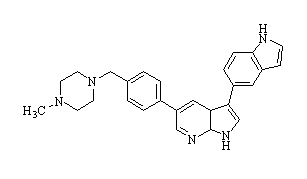 TC13172 is a mixed lineage kinase domain-like protein (MLKL) inhibitor with an EC50 value of 2 nM for HT-29 cells. URMC-099 is an orally bioavailable, brain penetrant inhibitor of Mixed Lineage Kinase 3(MLK3) with IC50 of 14 nM; inhibits LPS-induced TNFα release in microglial cells, HIV-1 Tat-induced release of cytokines in human monocytes, and up-regulation of phospho-JNK in Tat-injected brains of mice. 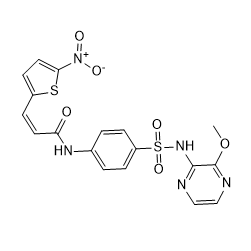 Necrosulfonamide is a novel inhibitor of MLKL (mixed lineage kinase domain-like).